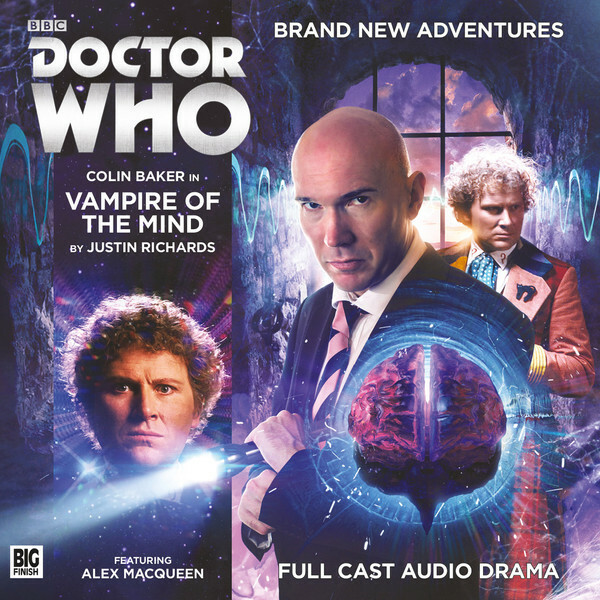 ‘Vampire of the Mind’ represents the second act of Big Finish’s Two Masters trilogy and continues the Master’s forty-fifth anniversary that also recently included an appearance in Jago & Litefoot Series 11. Whereas ‘And You Will Obey Me’ showed Geoffrey Beevers’s Master determined to survive at any and all costs, ‘Vampire of the Mind’ focuses on Alex Macqueen’s audio Master, offering a completely different but equally engrossing affair as a result. This version of the Master famously made his debut by pretending to be an unseen future incarnation of the Doctor, and his penchant for deception- even more, it seems, than his own former incarnations- returns here wonderfully, giving off a sense that he is immensely enjoying his little charades without going over the top. The fact that he is now crossing paths with the Sixth Doctor after initially shocking the Seventh Doctor means that an obvious plot device must be used to keep that previous story’s tension intact, and a necessary plot contrivance is duly used without too much issue. Truly apparent throughout this release, though, is Macqueen’s ability to mesh together a more nuanced persuasion akin to Delgado’s take with a more uncompromising determination akin to Ainley’s, offering something quite unique in the process. It must be said that this personality matches up with the more bombastic Colin Baker iteration exceedingly well and brings about some exceptional scenes and conversations. The plot of ‘Vampire of the Mind’ utilizes many familiar points, in a sense giving off the vibe of a classic serial. The scientific Dominus Foundation rewarding research grants in exchange for labour and a military fortress that the locals say is overrun by zombie-like creatures and which a trail of missing scientists seems to lead to each hearken back to early UNIT stories, and the Doctor himself even tries to contact UNIT for help as events unfold. So although the actual foundation of the plot may not offer anything ground-breaking or unique, it’s the character interactions that truly carry the tale. Baker and Macqueen are mesmerizing both independently and together, and one-off companion Kate Kennedy’s Heather Threadstone makes an immediate impact as a smart and energetic presence who also proves to be a great match for the Doctor. At the same time, some further insight is gained into the Master through a brief flashback scene, and it seems as though groundwork is being laid for a big revelation in the upcoming ‘The Two Masters’ regarding an event in the Master’s past to explain his presence and actions in earlier releases this year. Perhaps the greatest complement that can be paid to ‘Vampire of the Mind’ is that it very much feels like a throwback tribute to the stories featuring encounters between Jon Pertwee and Roger Delgado which, likewise, were often elevated by their strong performances. It can be a little disorienting to hear the Sixth Doctor reference and use the Internet, something that obviously was not possible during his televised era, but ‘Vampire of the Mind’ does a good job overall of mixing in some smaller and more humorous moments with the more overt drama, unafraid to throw in a few references to past Master tales along the way. The Master creating a subservient race of blanks is quite fitting in some ways, and it, along with the memory-absorbing mind leech, certainly lends a new layer to his typical evil plans. It’s a slightly darker tale overall that last month’s ‘And You Will Obey Me,’ but the pressure is squarely on ‘The Two Masters’ to deliver a satisfying resolution.